Total cost per half hour. 1. Getting a basic piano instrumental backing track. 3. Adding chords/ structure to a new melody/ song. 6. Those on a limited budget. 2. In-depth lessons. Learning how to play a song. 5. Recording a basic vocal idea with music. 6. Getting a handwritten chord chart. 7. Rehearsals on video/ Mp3. 8. Controlling your budget and time as needed! 1. Finishing a good demo with instruments and vocals. 2. Starting a basic website. 3. Getting multiple instrumental backing tracks with basic rhythm. 4. Starting a Music Resume' video. 5. Hearing your poetry as a song. 6. Getting type written music charts. 7. Stock piling hours at a cheaper rate. 1. Completing a radio ready song with full production, tuned vocals, mixed and mastered. 2. Completing a Music Resume'. 3. A set's worth of basic instrumental backing tracks. 5. Finishing a complete website with video, pictures and commerce. 6. Working on a complete CD. 7. Stockpiling hours at the cheapest rate! 1. 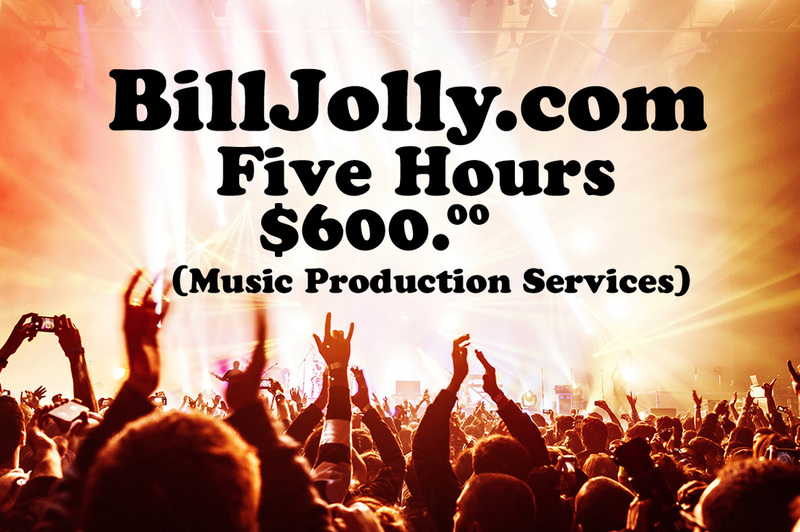 Live performance and remote recording rates are based on the individual needs and details of each project. Email us for more details and costs. 1. 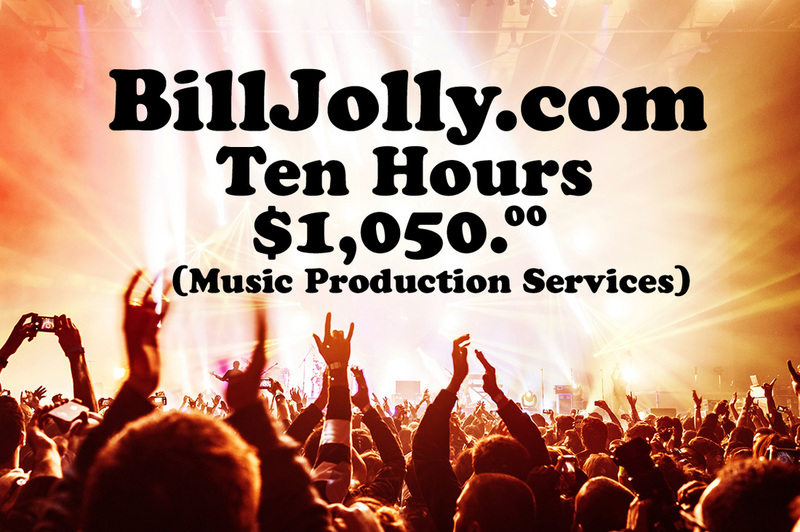 The great thing about purchasing production hours from BillJolly.com is that you can schedule your music AROUND your budget! 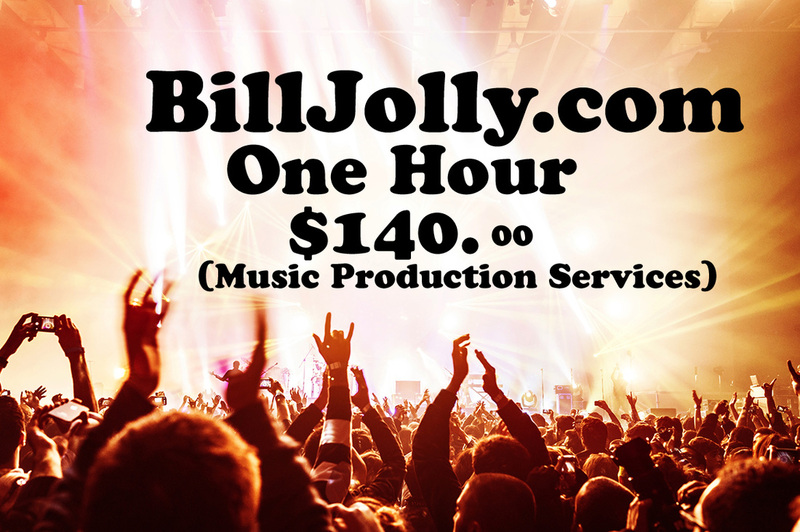 Buy an hour today and purchase the next one whenever your budget or time allows. 2. We offer bigger discount rates when you buy more hours in advance. 3. Most importantly, you DON'T have to use all of your hours at the same time. You can schedule your hours with us as you need them!